Technetium occurs naturally in the Earth's crust in minute concentrations of about 0.003 parts per trillion. This totals about 18000 tonnes at any given time, assuming the mass of the Earth's crust is 60000000000000000000006×1021 kilograms. Technetium is so rare because technetium-98's half-life is only 4.2 million years. More than a thousand of such periods have passed since the formation of the Earth, so the probability for the survival of even one atom of primordial technetium is effectively zero. However, small amounts exist as spontaneous fission products in uranium ores. A kilogram of uranium contains an estimated 1 nanogram (10−9 g) of technetium. Some red giant stars with the spectral types S-, M-, and N contain a spectral absorption line indicating the presence of technetium. These red-giants are known informally as technetium stars. ^ As of 2005[update], technetium-99 in the form of ammonium pertechnetate is available to holders of an Oak Ridge National Laboratory permit: Hammond, C. R. (2004). "The Elements". Handbook of Chemistry and Physics (81st ed.). CRC press. ISBN 978-0-8493-0485-9. ^ a b c d Rimshaw, S. J. (1968). Hampel, C. A., ed. The Encyclopedia of the Chemical Elements. New York: Reinhold Book Corporation. pp. 689–693. ^ a b c NNDC contributors (2008). Sonzogni, A. A., ed. "Chart of Nuclides". New York: National Nuclear Data Center, Brookhaven National Laboratory. Retrieved 2009-11-11. ^ a b c d Holden, N. E. (2006). Lide. D. R., ed. Handbook of Chemistry and Physics (87th ed.). Boca Raton, Florida: CRC Press, Taylor & Francis Group. pp. 11–88–11–89. ISBN 978-0-8493-0487-3. ^ a b c Yoshihara, K. (1996). "Technetium in the Environment". In K. Yoshihara; T. Omori. Topics in Current Chemistry: Technetium and Rhenium. Topics in Current Chemistry. 176. Berlin Heidelberg: Springer-Verlag. pp. 17–35. doi:10.1007/3-540-59469-8_2. ISBN 978-3-540-59469-7. 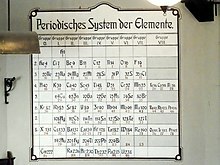 Wikimedia Commons has media related to Technetium. Look up technetium in Wiktionary, the free dictionary.